Many a bride has come to us in desperation because someone has told them that they will make their Brooch Bouquet for their wedding. Don't worry they have been told, I'll YouTube it, sure its just a bunch of brooches on wires tied together. 2 weeks before the wedding PANIC ... the bouquet wont stay together, I cant make it bigger, the oasis ball keeps splitting, the brooches are falling out, i don't have enough brooches, its cost an absolute fortune. We hear it all the time, we see people blog about making their own Brooch Bouquets and they have tried every technique they can find to hold it together, taking hours and costing lots and resulting in a bouquet that weighs an absolute ton. You do not use thick heavy wires to wire the brooch leaving ugly wires showing. Our easy to follow, easy on the hands technique will have you putting your bouquet together in a matter of 3-4 hrs. 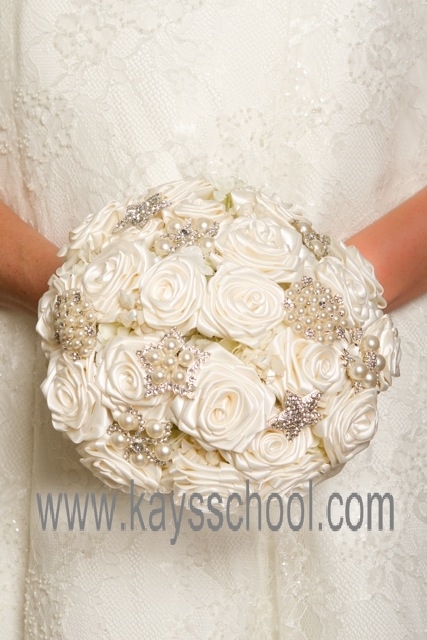 As a floristry school we use floristry skills and hidden secret methods to assemble our Brooch Bouquets. 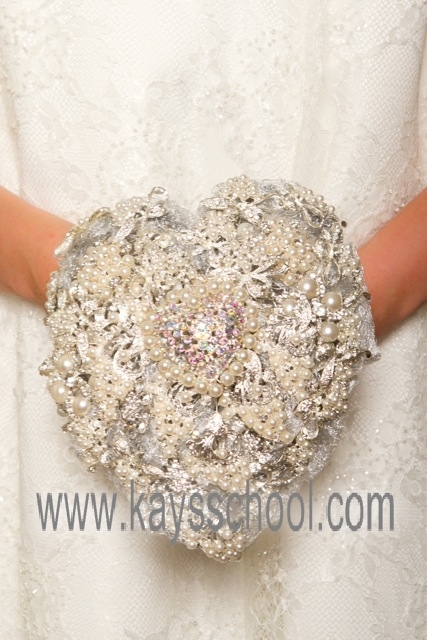 Our kits include 30 Quality Brooches that will make a Brooch Bouquet of approx 8inc diameter. which is a standard brides bouquets size. 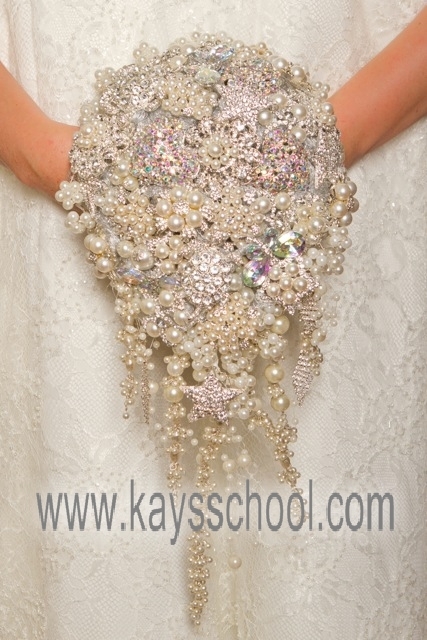 On top of the tuition for making a standard posie (round shape) brooch bouquets we can also send you on more advanced step by step tuition on how to make teardrop brooch bouquets, cascade Brooch Bouquets, Flower Girls wands and Wristlets and headdresses using brooches. But it doesn't end there, if you would like to incorporate fabric ribbon flowers info your bouquets, we also can send you on the link on how to make these fabric ribbon roses and directions on making them into a wedding bouquet. If you decide you wish to further your skills and make bouquets using buttons or seashells , as a past student of our school we will also send you on all the information to make these also. The question your asking is, How much is all this extra stuff going to cost?? 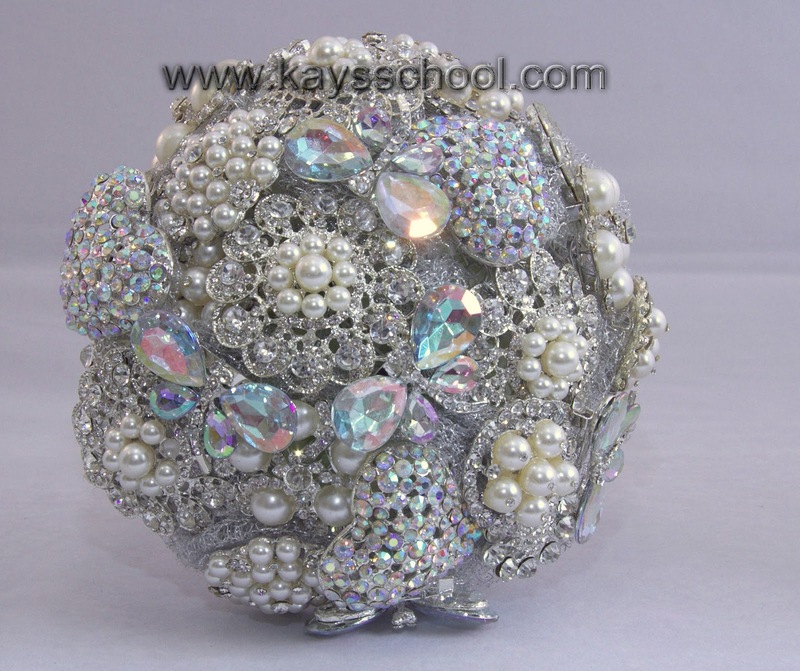 As a student of Kay's School of Floristry we offer all our students 100% backup and support, all of the above is included in your initial outlay for your Brooch Bouquet Kit. 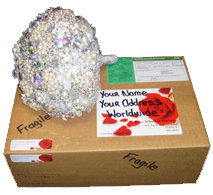 When you order our Brooch Bouquet Kits you order more than just "Making a Brooch Bouquet " Your buy the training and skills to use and maybe even start a new business venture. We also have a huge selection of brooches for sale if you wish to purchase more of our quality brooches. If you wish to order one of our Brooch Bouquet Kits quote BLOG10 by email to us to get 10 Extra Free Brooches in your kit.